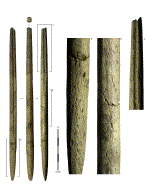 The importance of coastal resources in the late Upper Paleolithic of western Europe has been reevaluated in recent years thanks to a growing body of new archeological evidence, including the identification of more than 50 implements made of whale bone in the Magdalenian level of the Isturitz cave (western Pyrenees). 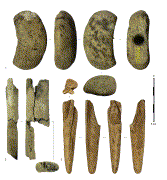 In the present study, the assemblages of osseous industry from 23 Magdalenian sites and site clusters in the northern Pyrenees were investigated, systematically searching for whale-bone implements. The objective of this research was to determine if, and how, tools and weapons of coastal origin were circulated beyond Isturitz into the inland, and if similar implements existed on the eastern, Mediterranean side of the Pyrenees. A total of 109 whale-bone artifacts, mostly projectile heads of large dimensions, were identified in 11 sites. Their geographic distribution shows that whale bone in the Pyrenean Magdalenian is exclusively of Atlantic origin, and that objects made of this material were transported along the Pyrenees up to the central part of the range at travel distances of at least 350 km from the seashore. This phenomenon seems to have taken place during the second half of the Middle Magdalenian and the first half of the Late Magdalenian, ca. 17,500–15,000 cal BP (calibrated years before present). The existence of a durable, extended coastal-inland interaction network including the circulation of regular tools is thus demonstrated. Additionally, differences between the whale-bone projectile heads of the Middle Magdalenian and those of the Late Magdalenian document an evolutionary process in the design of hunting weapons. Figure 1. Magdalenian sites and clusters of sites in the northern Pyrenees. The area investigated appears in more contrasted tones, and the white lines indicate the limits between the western, central and eastern zones. The ‘−100 m’ limit shows the location of the Paleolithic seashore approximately 100 m below present sea level. Black dots: sites with preserved osseous industry included in this study (numbers as in Table 1); gray dots: sites with preserved osseous industry, not included in this study; white dots: sites without preserved osseous industry. Pyrenees topographic and hydrographic map by Eric Gaba (Wikimedia Commons user: Sting). Europe map by Wikimedia Commons user San Jose. Sites after 117, 94, 34, 36 and 47; completed with numbers 8 and 9. Figure 2. Distribution of whale-bone artifacts in the Magdalenian sites of the northern Pyrenees (numbers as in Tables 1 and 2). The area investigated appears in more contrasted tones, and the white lines indicate the limits between the western, central and eastern zones. The ‘−100 m’ limit shows the location of the Paleolithic seashore approximately 100 m below present sea level. White discs: presence of whale-bone artifacts (the area of the disc is proportional to the number of artifacts); black X: whale-bone artifacts absent. Pyrenees topographic and hydrographic map by Eric Gaba (Wikimedia Commons user: Sting). Europe map by Wikimedia Commons user San Jose. Sites after 117, 94, 34, 36 and 47; completed with numbers 8 and 9. Figure 4. Espélugues: mesio-proximal fragment of whale-bone point with blunt base and bilateral grooves. a: detail of the oblique striations on the base; b: detail of the aspect of the material; c: detail of the distal bending fracture and the fine oblique striations on the bottom of the groove. Figure 8. Whale-bone wedges, shown with distal end pointing downwards. 1: Isturitz layer I/F1, complete wedge (recycled from foreshaft fragment?). 2: Isturitz layer SI/Eω, mesio-distal fragment of wedge with bilateral grooves and crudely shaped distal end (recycled from projectile point?). 3: Mas d’Azil, almost complete wedge with longitudinal groove on one side and oblique striations on another (recycled from projectile point? ); a: detail of the groove; b: detail of the striations. 4: La Vache layer 4, distal fragment of wedge; c: detail of the compressed distal end and transversal crushing marks. Figure 9. Other types of whale-bone artifacts. 1: Espélugues, unidentified artifact. 2: La Vache layers 3 and 4, mesial fragment of unidentified artifact. 3: Mas d’Azil, possible fragment of blank.